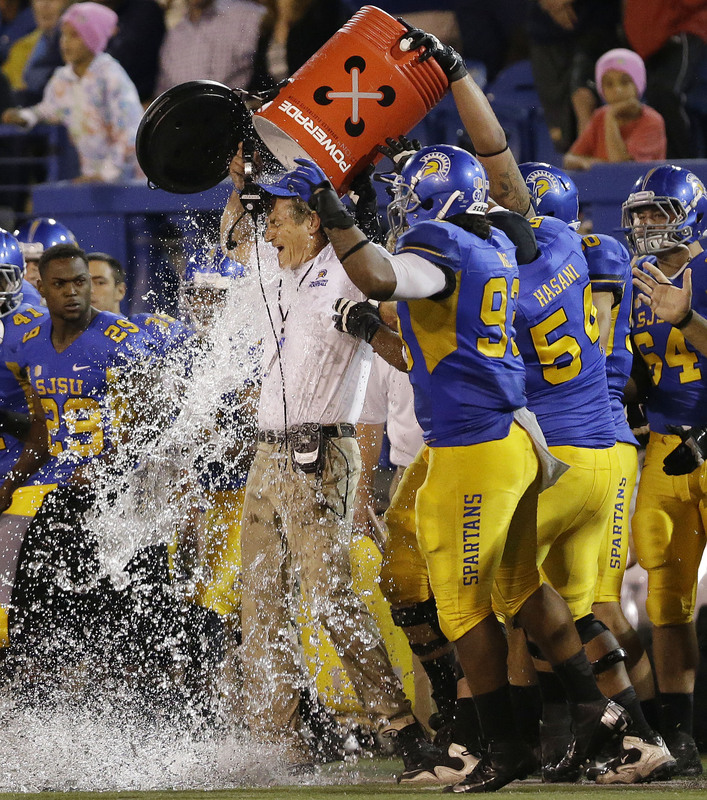 San Jose State opens its first campaign in the Mountain West Conference by starting over. A new coach, a roster with mostly new faces, a new conference, and a new bag of money to play with for the future (allegedly). Add to that likely new facilities that are on the way, and it could mean moderate success three or four years down the road. The Spartans open next week with a pair of exhibitions at home, Monday against D-II Cal State Monterey Bay, and then Wedensday against Pacific Union. This season is going to be about grinding it out. The Spartans are still woefully behind the rest of its new conference in every respect, and when 2014 rolls around, they will likely find that out the hard way. This is a team that hasn’t been to the NCAA Tournament since Olivier Saint-Jean (now Tariq Abdul-Wahad) played for them in 1996, and this year isn’t looking the year that streak ends. By most team’s standards, San Jose State’s schedule isn’t so bad. The early season features just one team that made the tournament last year (James Madison at the NIU Tournament), and just four teams with winning records last year. Clearly, the Spartans can build some confidence and win games in the first 12 contests of the season. The Spartans will take on Milwaukee (8-24 last season) and Northern Illinois, which won just five games last year and hasn’t sniffed a winning record in seven years. Westminster (Utah) and Pacifica shouldn’t be on any Division I team’s schedule, but sure, why not. A visit to Houston figures to be the hardest early season contest. Winnable games in the nonconference schedule: Milwaukee, Northern Illinois, UC Davis, Pepperdine, Cal State Fullerton, Portland, both non-Division I games. Likely losses: Weber State, Houston, James Madison, Santa Clara. The revamped squad and early season cupcakes could easily be riding a wave of confidence — and a winning record — into the conference play if this team plays its cards right and proves the naysayers wrong. The problem for the Spartans is that nothing they do before the new year means anything. On January 1, they open Mountain West play at home against Nevada, and everything likely be down hill from there. There are no less than 10 conference games you can probably put in the loss column right now — the home and homes with New Mexico, San Diego State, Utah State, and Colorado State, at Boise State and at home against UNLV. The Mountain West has a lot of talented teams, and San Jose State is in Year 1 of trying to build a competitive team. Especially a matchup against a talented Rebels squad, even at home, is not going to end well for the Spartans. If this team wins any of those games, it will be among the biggest upsets in conference this year. The saving grace for San Jose State is that they only see UNLV and Boise State once each. Imagine being in this type of rebuilding year and having Utah State’s schedule, in which they will have to play San DIego State, UNLV, New Mexico, Colorado State and Boise State twice. The Spartans were picked to finish dead last in conference by the media, and rightfully so. There’s very little to get excited about considering last year’s team was just 9-20 last year, falling apart after leading scorer James Kinney was put on the shelf for behavioral reasons. Conference play has winnable games, too: Air Force was picked second to last in the conference, and Nevada appears to be in decline. Fresno State an Wyoming are mediocre teams, but expecting to beat either one would be a massive overreach for the Spartans. This isn’t going to be a tournament team. The conference schedule simply won’t allow it. The best thing that could have happened after last year is to make a clean break. And that’s precisely what happened. Coach Dave Wojcik is a good starting point for this squad, and he’s got a good, young base to start. Only four players are back, including senior Chris Cunningham and 7-foot-1 post Mike VanKirk, who played sparingly last year and needs to bulk up from a meager 240 pounds. Getting Rashad Muhammad and Jalen James are the obvious big gets of last year’s signing class, the type the previous coach George Nessman could never have pulled together. Both were three star recruits from out of state, Muhammad coming from Las Vegas Bishop Gorman as the touted younger brother of of T’Wolves first-round pick Shabazz Muhammad, and James was a national top 50 point guard recruit. But he also hit Texas hard and may have walked away with some gems. Isaac Thornton, a 6-foot-3 guard from San Antonio Sam Houston, was a leading scorer on a talented team and 7-footer Mathew Pollard played for a Houston prep school and Kashmere High before that. With any luck, he has found a couple of key bench players this season. But the overarching theme is inexperience. There are six freshmen on the team and four more fresh faces on the roster. Chris Cunningham will be the team’s veteran presence, which is fitting considering he’s the only senior on the roster. He averaged 9.0 rebounds per game last year and about 10 points per game; he’ll need to build on that for the Spartans to be competitive. D.J. Brown is also back, and will be looked to for leadership. The one advantage to all of this? No one knows anything about this team, and expectations are subterranean. There are few good scouting reports out there, which gives them an element of surprise. Whether that will translate into a win or two is another story, but it’s there. Wojcik was brought in to make the changes needed to make this team viable in the Mountain West. That’s a marked difference from the previous administration. George Nessman’s job was to do a lot with the least of almost any team at the NCAA D-I level. Considering what he had to work with — an office in the parking garage on 10th Street, no permanent locker rooms, no practice facility, a small budget for everything including assistants — his 8-year caretaker tenure as head of the program can be considered a reasonably successful one. That he even led the team to a winning season is a minor miracle. But more is going to be expected now. And the reality is that Nessman’s recruiting was substandard even with the bad hand dealt to him (he needed a high profile transfer in Adrian Oliver to find success, and even with 17 wins in 2009-10, that team could have easily won more.) AD Gene Bleymeier says many of the needed improvements are on the way, and the new coach — a former Boise State assistant — has never been an assistant to mediocrity. Much like his team of freshmen and JC transfers, he’s still kind of an unknown quantity; after all, this is his first head coaching gig in more than 20 years in the business. He was a key part of Leon Rice’s staff with the Broncos, which have emerged as a basketball program in recent years. If he can bring some of that magic to San Jose, the future might be bright. He’ll have some financial backing, and he’s built a good team to start considering the tire fire San Jose State basketball has been in the past. If they can survive the initial lumps of this season and find some talent to build around going forward, this can hopefully be a stable team, and with more luck, a decent one. — Growth and improvement: This is a young team that has the deck stacked against it. The goal this season for Wojcik should be to keep his touted freshmen moving forward, and not focused on losing. Coaches may not like having to settle for moral victories like making good teams sweat a little and not getting blown out night in night out, but that may be the best the Spartans can do as they continue to build toward regular relevance. — Keep everyone after the season: San Jose State has always had a transfer problem; if you’re going to be using D-II quality facilities, might as well be trying to win at the D-II level, after all. Many of the improvements are still months and years away, and that may be incentive for talented players to try their hand elsewhere. Wojcik’s job is going to be not only to get the most out of them, but to keep them from bolting to other schools, be it better programs of lesser ones. — Hope the influx of money turns San Jose State into a reasonable choice: Right now, it’s not. There’s still no permanent locker room for either basketball teams, laughable facilities and sparse crowds on a nightly basis, even for marquee matchups (when they even come to the Event Center.) The administration needs to make good on its promises to improve San Jose State’s program as quickly as possible, that way, when Wojcik uses it in his recruiting pitch, it isn’t just another hollow promise. Right now, the only good way to bring the program up is to throw money at it. With the improvements will come recruits who can play, and following that a chance at winning. It’ll never be more than that, but is has to be better than the setup in previous years, where the Spartans had both arms tied behind their backs and were being beaten about the head and shoulders by better-funded programs. William Jessup hung around, but ultimately coach Jamie Craighead’s debut on the bench of San Jose State was a winner as the Spartans beat the Warriors 104-76 on Tuesday night in a game that counts for little more than a warmup for the regular season. Jasmine Smith had a double-double, getting 18 points and 19 rebounds and Ta’Rea Cunnigan added 19 points and played an integral role in keeping the scoring going in the first half. San Jose State’s Rebecca Woodberry led all scorers with 23 points, going 8 for 13 from the field and 4 for 7 from 3-point range. The real fun begins for San Jose State next Friday against D-II San Francisco State at home. — Congratulations, San Jose State offense, you can add got a defensive coordinator fired to your list. Wyoming canned defensive coordinator Chris Tormey on Tuesday , WyoSports.net reports, after the Cowboys gave up 103 points over the last two games, losses to archrival Colorado State and to San Jose State, and have generally been awful this season. D-Line coach Jamar Cain takes over as defensive coordinator for Wyoming. — Spartans star quarterback David Fales missed practice on Tuesday with an illness, the Merc reports. His status for Saturday’s game is not in doubt: He will play. — If it wasn’t enough that San Diego State is opening up its kicker position to competition, Fresno State is too. Well, only on kickoffs, reports Robert Kuwada of the Fresno Bee, which will be between punter Garrett Swanson, who handled said duties last year, and freshman kicker Colin McGuire, who has been doing it this year only 12 touchbacks in 52 kickoffs this season and none in the last two games. if there’s one easy and obvious weakness for the Bulldogs, it’s kickoff coverage: Fresno State is allowing 26.3 yards per return, which ranks 117th of 125 teams in the FBS. — Boise State will be without defensive end Dillon Lukehart for the first half of Saturday’s game against Colorado State after he was ejected for targeting. — The Broncos and Nevada played one of the most memorable games of 2010, but after that point began a decline for both programs, writes Mark Anderson of the Las Vegas Review-Journal. Boise will emerge from sanctions that took away nine scholarships this year, and the program has been wracked with injuries this season, leaving them with their worst mark at this point in the year since 2001 and worst of the Chris Peterson era. Nevada’s woes might be longer term, at least if you listen to the quotes coming out of Reno. “There is a myth out there that I inherited a well-oiled machine,” Wolf Pack coach Brian Polian told the Gazette-Journal. — After needless confusion and consternation, New Mexico will retire Brian Urlacher’s No. 44 in a ceremony at the game against Air Force on Nov. 8, the Albuquerque Journal reports.